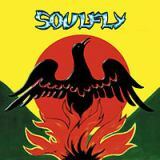 SOULFLY - PRIMITIVE (CD) | Online Shop | Wizard LTD.
Rolling Stone (9/28/00, pp.53-4) - 3.5 stars out of 5 - "Old-school...Primitive is deeper...in the sound of [ex-Sepultura frontman] Max Cavalera's lived-in growl, the churning effect of a 4-string guitar and his concerns." Q magazine (11/00, pp.114-6) - 3 stars out of 5 - "While [their] percussive, ethnic grooves certainly make an impact, it's only when Cavalera allows his formula to be altered by others that sparks truly fly." Alternative Press (11/00, p.128) - 3 out of 5 - "With pre-millennial speed metal rubbing elbows with hip-hop, excursions into ambient instrumentals and acerbic soul, and a host of guests...Primitive is certainly a record [with] breadth." CMJ (8/28/00, p.32) - "More relaxed than their debut, the low-end slaughterhouse riffs are still embellished with Cavalera's beloved tribal percussion....[It] locks its teeth into the jugular." Melody Maker (10/10/00, p.50) - 4 stars out of 5 - "The metal album of the year so far....An incendiary blend of nu metal, reggae and Brazilain rhythms." NME (11/4/00, p.46) - 7 out of 10 - "Draws on Max's political rage at colonial history and crimes of the conquistadors....the heavy metal Bob Marley..."
All songs written by Max Cavalera except where noted.